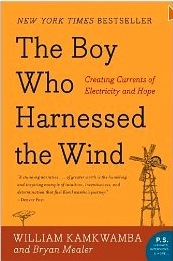 The Boy Who Harnessed The Wind is an amazing book of survival and sacrifice. It shows how when you put your mind to it, anything is possible. This book is a biography about William Kamkwamba and the lengths that he goes to to provide electricity for his family. The book starts when William is about my age (12) and goes on until he is about 22. This book takes one through his life story of creativity, courage and determination against all odds. William lives in a rural village with his family that has limited means. William is forced to drop out of school when they do not have enough money to pay for his school fees. There is no electricity in the village, and even if William checks books out from the library, the only time to read the book is after dark when he is done helping his father with work. William wants electricity but has no way to have some, so he decides to create some himself by building a windmill. He reads many science books and tries to make a windmill from the trash in the junkyard since his family cannot afford the materials. The villagers call William a madman and his parents are also starting to worry. Will William succeed and be able to provide electricity for his village?